Get the rich color imaging of 3 panel LCD technology in a compact, lightweight projector. More than bright... it’s Brilliant! This Multimedia Projector is designed with the most advanced technology for portability, durability and ease of use. This projector utilizes built-in multimedia features, a palette of 16.77 million colors and matrix liquid crystal display (LCD) technology. 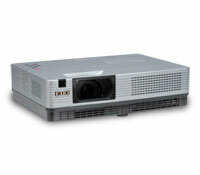 A low cost, full featured projector with zoom lens and network monitoring and control. 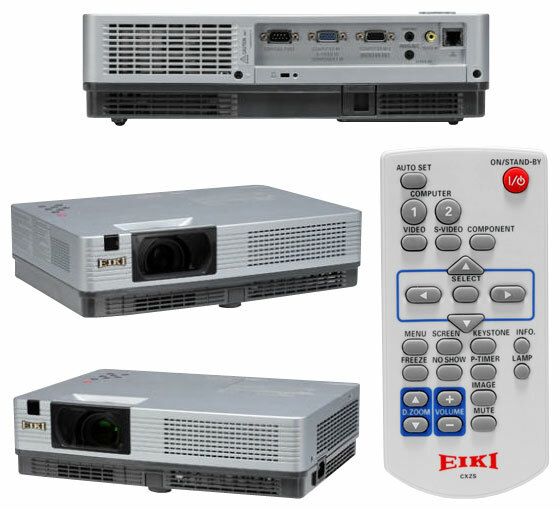 The projector is able to convert from Interlace to Progressive and is UXGA & WXGA compatible. The countdown can be optionally skipped at startup, and the AC power cord can be removed immediately after OFF. This projector is designed compact in size and weight. It is easy to carry and installed anywhere you wish to use. The projector has the Multi-scan system to conform to almost all computer output signals quickly. Up to UXGA resolution can be accepted. The AC power cord can be unplugged immediately after turning off the projector without waiting for the termination of the cooling fan rotation. Operation menu is available in 18 languages: English, German, French, Italian, Spanish, Portuguese, Dutch, Swedish, Finnish, Polish, Hungarian, Romanian, Russian, Chinese, Korean, Japanese, Thai and Turkish. The security function helps you to ensure security of the projector. With the key lock function, you can lock the operation on the top control or remote control. PIN code lock function prevents unauthorized use of the projector. Lamp and filter maintenance functions provide for better and proper maintenance of the projector. This projector is loaded with the Wired LAN network function. You can operate and manage the projector via network. This function enables input search, Auto Keystone correction and Auto PC adjustment by simple pressing the AUTO SETUP button on the top control. At the time of simple projection on the colored wall, you can get the close color image to the color image projected on a white screen by selecting the similar color to the wall color from the preset four colors. The projector provides a switchable interface terminal. You can use the terminal as computer input or monitor output conveniently. The power management function reduces power consumption and maintains the lamp life. Closed Caption is a function that displays the audio portion of a TV program as text on the screen. The closed captioning service is available mainly in the U.S.
2600 ANSI Lumens, 85% uniformity, and 500:1 contrast ratio. Weighs only 5.5 lb (2.5 kg)! Compact and lightweight design. True XGA resolution. UXGA–VGA and MAC compatible. Convenient 1.2 X manual optical zoom lens. Preset image offset. Auto Vertical digital keystone correction. VGA-type computer input and computer monitor output. Custom warm-up screen image option. Color board modes. Wireless remote control. 50%–400% digital zoom. Quiet operation. Long-life lamp. Power saving features. Closed caption. Auto Setup: Keystone correction, Input search, PC Adjust. Throw Distance (tele–wide) 4.3'–38.7' (1.3–11.8 m) Cabinet Size (HxWxD) 3.7" x 13.0" x 9.3"